If you have symptoms of a claw toe, see a consultant for evaluation. You may need certain tests to rule out neurological disorders that can weaken your foot muscles, creating imbalances that bend your toes. 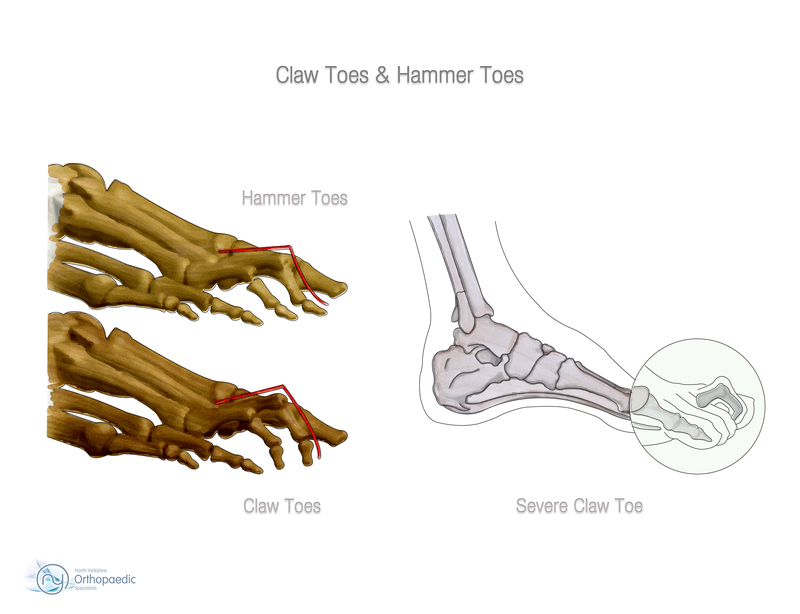 Trauma and inflammation can also cause claw toe deformity. Straightening the Toe (Proximal Interphalangeal (PIP) joint resection). If there is a fixed deformity at the PIP joint (the first “knuckle” of the toe), this joint can be removed, or repositioned in a straightened position and then fused with some type of fixation, often a wire insert through the toe. This joint may not fully heal with bone, but even a fibrous union (scar tissue) in a straight position will be effective. MTP joint (joint at the base of the toe) soft tissue release (capsulorraphy/capsulotomy). Because the MTP joint flexes up, the top part of the joint capsule (soft tissue) becomes very stiff and contracted. It is often necessary to release this, in order for the joint to fall back into the normal position. The MTP joint is held with a temporary wire in the new “straighter” position. Extensor tendon lengthening. Often the tendons that pull the toe upwards (long extensor tendons originating from the extensor digitorum longus muscle) will become contracted and tight. These tendons can be lengthened to allow the toes to fall back into an improved position. Flexor to extensor tendon transfer [Girdlestone-Taylor procedure]. This procedure involves a release of one of the tendons that pulls the toe downwards (the flexor digitorum longus) at the tip of the toe (distally) and a transfer of this tendon to the top of the toe (dorsal aspect of the proximal phalanx). This procedure aims to convert one of the primary deforming forces leading to clawing of the toes into a force that helps correct the deformity. It produces a fairly predictable correction of the toes, however, the surgery is slightly more involved than some of the other procedures. Malunion: It is common for the toe to heal in a position that may not be perfectly straight. Minor degrees of deformity will be mostly a cosmetic concern, which is why almost all consultants discourage patients from having toe surgery if the concerns are mostly cosmetic. Recurrence of the Deformity: Other complications include failure to fully correct the claw toe deformity or the potential for recurrence of the deformity over time. Loss of blood supply to the tip of the toe. The blood supply to the tip of the toe can be tenuous. There are two small arteries (one on either side of the toe) which supply blood to the tip of the toe. If the blood supply to the tip of the toe is lost the tissue will die and it may be necessary to amputate part, or all of the toe. However, these risks do not ocur often and most patients are happy with the results from this surgery.